Click on ReD Arrows To Go There!! 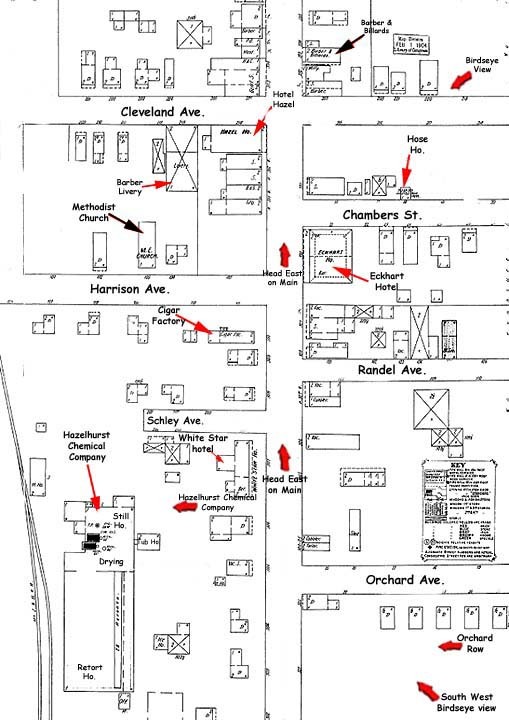 This is the Hazelhurst Chemical plant shown in the Sanborn-Perris fire insurance map of hazelhurst in August 1903. The Sanborn-Perris map were developed for thousands of towns in America for the purpose of assessing fire insurance rates of various dwellings, business establishments, and factories. These maps generally contained information regarding building footproint, building materials of construction, number of stories, doors, windows chimneys, elevators, lot lines, (dwelling, hotel, church, etc...) , street widths, water pipes, hydrants, cisterns, and water reservoirs.